Pretend you are your child. Take a look around your house. What do you see and hear? Too many toys? Clutter? Nothing to do? Is it noisy? Do you know where everyone is and what they are doing? The way we set up our house and our lives directly affects how our children behave. A house and life that is cluttered and chaotic can reek havoc on some children. They are overwhelmed, overstimulated, and don't know how to handle their emotions. 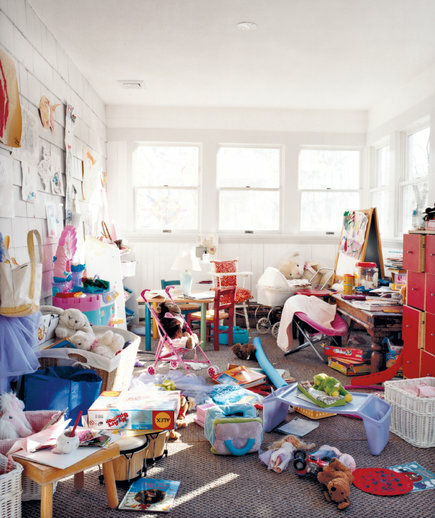 Here is an example of clutter in a playroom. When a child walks in to the room on the left, he is overwhelmed. Where does he start? What toy does he play with? Where can he play with it? Where is the specific toy he came in here for? 1. Only keep out some toys. Depending on the age of your child, you can pack some toys away. Each week or month, you can trade the toys out. This way your child doesn't have to paw through millions of toys. And, every time you trade the toys out, it's like getting a special treat for your child! 2. Have a place for everything. The old adage, "A place for everything, and everything in its place," is a great phrase to live by. You can cluster like items together, such as arts and crafts supplies in one corner and maybe cars and trucks and blocks in another. Books can have a special place, for instance in a basket on the floor by a bean bag or chair or on a certain shelf in the toy room. Following through on clean up is a big help too! 3. Have your children help! Knowing they got to pick where they keep certain toys in a play room or their bedroom helps them feel ownership in the entire process. This can lead to more responsible actions such as cleaning up and wanting to help with organizing. Plus, it teaches them responsibility and takes some work off your plate! 4. Make sure they clean up every day! Taking a few minutes each day (preferably right after they finish playing) to clean up can save a big headache later. Take a picture of a clean room and post it by the door to remind your children of how nice it is when it's clean. Use a timer and challenge them to clean it up as fast as they can. If you don't have time during the day to clean it up, make sure they do the job before they go to sleep at night.